In addition to the full line of industry-leading Raynor Garage Door products, Allstates Garage Doors specializes in the sales, installation, and service of standing seam metal roofs from Englert. Nothing performs like an Englert metal roof. 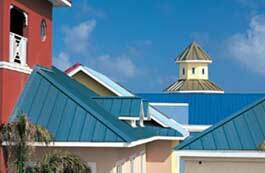 They offer the widest range of metal roofing solutions in the industry with all the roof profiles, finishes, textures, architectural details and structural options you want. Custom colors with quantities as low as 5000 lbs.